It's Friday which means it's my Creative Team day and today we have our Lovely Linda with a fantastic altered art project that will surely make a wonderful Christmas gift! Do you prepare handmade presents for your loved ones? We hope you feel inspired! It’s time to start thinking about the Season of Giving. Here we will be celebrating Christmas, and it’s always fun to make a few things for those who enjoy an Artsy Creation. 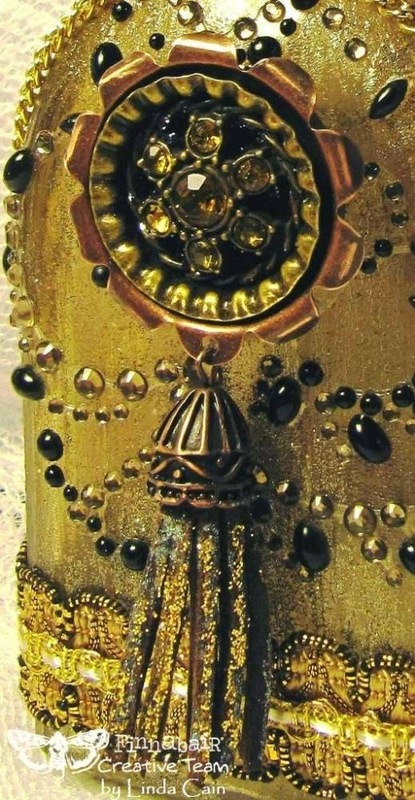 Since it’s a time when we all love a bit of sparkle, I thought I’d decorate a glass bottle with layers of glitz! When dry, I added a coat of Clear Texture Crackle. The heavier the layer, the larger the cracks, and I found you need it to be a thinner layer to dry clear. I LOVE the tiny little cracks it creates. I added a 2nd coat when it was dry. Next, I added layers of Distress Inks in browns, oranges and black soot. Heat set. I dry-brushed Soft Matte Gel in areas. Your inks will run together a bit. That’s good. Then sprinkle the glued areas with Charcoal Art Sugar. I really think this turned out cool! The glass stopper was painted with Heavy Black Gesso first, then a layer of Copper Crackle Paste. Here you see it before it dries. I used a thinner coating so the Black Gesso shows through in spots. Set aside to dry completely. I glued a button into a medium gold Bottle Cap that was then layered into a medium sized Pendant Cap using 3D Gloss Gel. A jewelry tool was used to roll the edges of the Cap when it was done drying. Sprinkle the gorgeous Blue/Black Ebony and Ivory Glitter into the background using Soft Gloss Gel for glue. This piece starts out as a Mechanical Flower. I used jewelry snips to remove every-other section in this round metal piece. When the topper is dry, carefully bend the Mechanical over the top of the stopper and glue with 3D Gloss Gel. I added some vintage trim with 3D Gloss Gel and some Say It with Pearls from Prima to the bottle. Cut the sheet of Pearls in half and add some to the back and some to the front sections of the bottle. The Tassel was loaded up with some gold glitter from the Luminous Collection and more Ebony and Ivory Black glitter. The Mechanical Rose with the Ebony and Ivory Glitter is used to adorn the top. A large clear Rhinestone is added to the center of the flower and glued to the stopper with 3D Gloss Gel. A second layer of decorative ribbon is added to the bottom and the neck of the bottle. A Gold Chain is looped over and criss-crossed at the top for just a bit more glitz. I really think it added a lot to the bottle. I hope you enjoyed the tutorial today and use it to make some wonderful gifts this year. The possibilities are endless when it comes to what you can create with a bit of glitter and glue! How wonderful ! Love the tutorial, the idea of cutting out the metal. So beautiful inspirational work !!! Wofw - what a transformation. This looks amazing! all I can say is WOW!! Just gorgeous. Incredible Bottle and oh so gorgeous!